The Cataclysm expansion for online game World of Warcraft (WoW) sold more than 3.3 million copies the first day it was on sale, claims Activision/Blizzard. The games developer said sales on the 7 December launch meant Cataclysm was the fastest selling PC game ever. The former holder of that title was Wrath of the Lich King, the expansion for WoW released in 2008. Market analysts GFK Chart Track said the earlier expansion still holds the title for in-store sales. 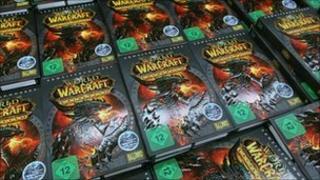 Chris Poole, senior analyst at GFK Chart Track, said it was hard to make direct comparisons between sales of Cataclysm and Wrath of the Lich King. This was because Cataclysm was available as both a boxed and download version on launch day but the Lich King was initially only available in stores. "However," said Mr Poole, "it is entirely possible as Activision/Blizzard claim, that Cataclysm could be a record launch for a PC game if you take into account sales through digital downloads." Activision/Blizzard made it easy to get hold of Cataclysm by pre-loading it on players' PCs prior to launch day. This meant that to play in the expanded world gamers just had to buy an activation key. This could explain why Cataclysm did not top games sales in the week it was launched. Instead, it was in third place behind Fifa 11 and Black Ops. Mr Poole said boxed versions of console games far outsell those of PC games. For instance, he said, the sales of recently launched Call of Duty Black Ops outsold Wrath of the Lich King by almost six times on its debut day. About 12 million people around the world play World of Warcraft with almost half that number being in Asian nations such as China and Japan.